*Note: I received a complimentary copy of this book from Thomas Nelson through Netgalley. Opinions expressed in the review are completely my own. 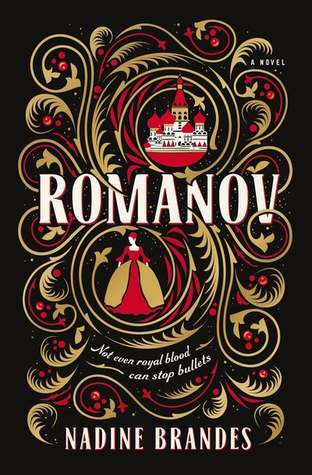 Thank you for the opportunity to read Romanov! Publication date, length, etc. subject to change. Second note: some of this may seem like a spoiler, but Brandes does a wonderful job of intertwining history WITH the magical pieces. Anything I bring up historically, really did happen and shouldn’t be a surprise at all. I think [know] I let myself get too hyped about this and was a little disappointed overall. It was still a good standalone that had the historic story as the basis with magic woven in so well that I was intrigued from the start! Some kinks left me wanting more. I read this digitally, so let’s see…it took til 54% through the book to FINALLY GET OUT OF THE HOUSE. I know we’re in exile, but I was dying to see something else in my mind. There wasn’t a lot of world building. I felt that I was expected to know what Russia and these other places looked like already so I missed out on the detailing of it all. What I found really interesting was how Brandes gave the Romanov’s such humanity. History dictates that this 300+ year old royal line was all kinds of crazy cruel (and that’s putting it lightly). Now, I only know so much, this last group with Nicholas II as tsar could have been a more decent family than I’m aware of. It made me stop and think that all in all, this was a family. And this family was brutally murdered without trial. This gave the whole family a lot more depth as “characters”. They prayed together, were sincere to their captors, and were only wanting to be released somewhere together. Anastasia was fiercely loyal and protective of her brood. There was a huge emphasis on forgiveness from her character. This ideal repeatedly comes up as she struggles (rightly so) accepting her new fate. My biggest loss was the magic system. I have no idea how it works. Very little was ever explained. There’s spell masters, spell ink, some can use it, some can’t, how is it made, can anyone be a spell master, how does this spell work, SOMEONE HELP ME. I am so confused. Since this was the fantasy portion of the book I was looking for a more detailed story-line of why magic was the target of the Red Army in the first place. I am frazzled with one piece of the ending and booed at my book when it happened, but besides that this was the best ending for this book. And I mean that in a good way! Since it follows history, there’s an assumption of what could’ve happened. I thought it was sweet and hopeful that fates cards were dealt differently for the Romanov’s than what history served them. One of my favorite parts of books are the Notes from the author (yes, I totally read those). When fully explained, they can really enhance the book! There was a wonderful explanation of what was true, what wasn’t, and why she made certain creative decisions. It honestly made me like the book even more. I was totally surprised about some pieces actually being true! It helped me better understand the plot and the addition of some characters. Next postNovember 2018 Monthly Wrap-up!